The lovely, white ﬂesh of pollack goes really well with a citrus dressing and the earthiness of dill. Use a bit of Douglas ﬁr in this dish if you can get some, it goes brilliantly with the other ingredients. 1. For the dressing – pare the zest from 2 oranges, keeping a little pith on, and dice. Place in a small saucepan, cover with olive oil and heat gently over a low heat until the skin is just soft. Leave to cool. 2. Squeeze the juice from all the oranges into a small pan with cider vinegar and sugar. Bring to the boil, dissolving the sugar. Let it bubble to reduce by two-thirds until thick. Put in a bowl to cool. 3. Add the orange zest and olive oil mix to the orange juice reduction, whisk to combine. Stir in the chopped dill and pine needles. Set aside. 4. For the ﬁsh coating – mix all ingredients in a large bowl. Heat a 2cm depth of oil in a deep-sided frying pan until it reaches about 180°C. (Drop a cube of dry white bread into the oil – if the bread turns golden brown in just under a min, the oil is ready). 5. Dust the ﬁllets on both sides with the cornmeal. Fry for 2–3 mins each side until the crust is crisp and golden brown. carefully transfer to a tray lined with kitchen paper to drain. Season lightly with salt. 6. 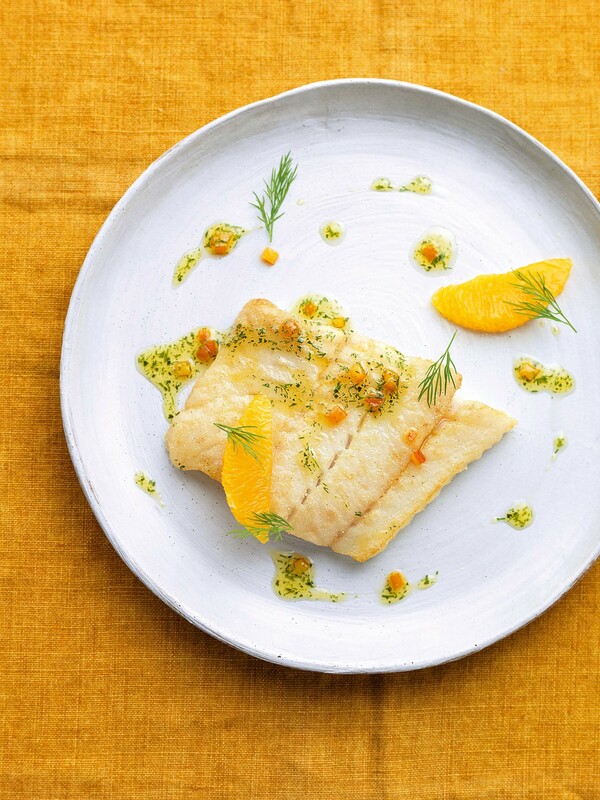 Serve the ﬁllets on warmed plates, garnished with the orange segments, dill, and dressing. From Tom’s Table by Tom Kerridge, Absolute Press, £25.